Size pictured hanging on the wall above is 16"x12". I recommend the largest option for your bigger spaces (like above your bed/couch). Become a Whimsy VIP for a 20% discount code to use at checkout! 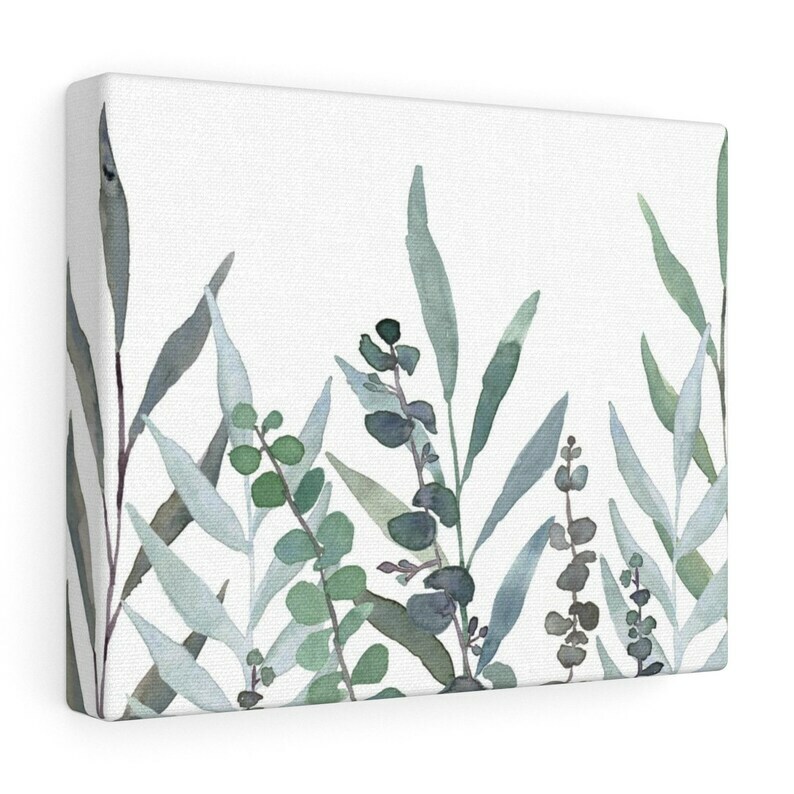 This is the Among the Eucalyptus Stretched Canvas Wall Art. It is a beautiful piece of decor adorned with a forest of watercolor eucalyptus sprays in cool greens and grays. A perfect addition to any room, this print brings the beauty of eucalyptus inside your home to help you make your house your haven. The canvas is a finely textured, artist-grade cotton substrate, which reproduces image details with outstanding clarity and detail. -Available in multiple sizes for your decor needs, from 10"x8" to 30"x24"
-This canvas wall decor has a unique, hand painted watercolor design, designed by me, Jillian Anderson. While I designed and painted the eucalyptus, it is printed with ink using a sublimation printer by my production partner through Printify. They will print your canvas and send it right to your door! -Please ask any questions you may have before ordering. -You will receive one stretched canvas print in the size of your choosing. Don't forget to choose which size you would like. Love my shower curtain. It’s so beautiful and the fabric is very nice quality. I’ve received lots of compliments on it which is unusual for a shower curtain. This duvet is gorgeous! I'm so excited to use it to brighten my room during the upcoming winter months. This mug is so great! It was everything I expected it to be. The designer is a great partner with which to work and so responsive, not to mention brilliantly creative ;) I can't wait for winter to use this mug with SO MUCH TEA! This bag is adorable!! Seller is excellent to work with...will definitely buy from her again!! Why is the processing time so long? Printful Inc. and Printify handle the printing and shipping portion of this outfit, and they print on demand - so it takes a little extra time to process your order. Please be patient and know it will be in your hands SOON and - you will love it! Can I change my shipping address after placing my order? You must make sure your Etsy address is the correct address when you check out. I am unable to change the shipping address once you have placed your order as a protective policy. This is a suggestion from Etsy itself. Please DOUBLE CHECK your address is correct, as I will send the package to that address. If you need to change the address, request an order cancellation within 6 hours of your order. This will be a case-by-case basis because I send your items into production as soon as I can - which is often before 6 hours. I accept returns, minus a 12% restocking fee. Please contact me before sending your item back so we can work out the details. You will need to send the item to a different address than the one on your package - that address is the address of my fulfillment partner. Returns are only valid on unworn, unused items in brand new condition.